Check out and follow our official MFGG Twitch channel for livestreams on our competitions, fangaming, news, perhaps podcasts and more from your MFGG staff! You may be able to check out staff member streams even when the OfficialMFGG channel is offline as well! The rules for the chat are basically an abridged version of our Discord rules (https://forums.mfgg.net/showthread.php?tid=76). 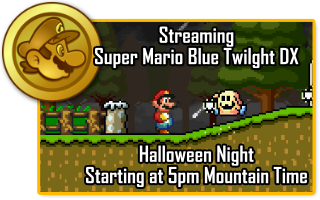 OfficialMFGG will be going live tomorrow night starting at 5pm Mountain Time (4pm Pacific, 6pm Central, 7pm Eastern) w/ Super Mario Blue Twilight DX by BlazeHedgehog. A MFGG Halloween classic, this game is the one that got us on TV. OfficialMFGG is now live w/ Super Mario Blue Twilight DX! An MFGG Halloween classic, this is the fangame that got us on TV! See ya there! Streaming some Games of the Month today at 9am Mountain Time! Let's see how well they hold up! Follow us at https://www.twitch.tv/officialmfgg so you don't miss us! Now streaming some MFGG Games of the Month! Let's see how well they hold up! 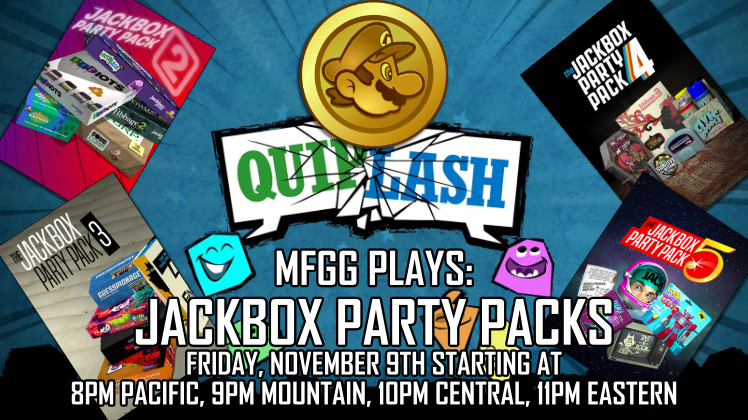 Join MFGG for some wickedly good fun with Jackbox Party Pack on Friday night. Content may not be suitable for all viewers. Stream will go live on https://www.twitch.tv/officialmfgg and interaction will be done through Discord voice and Twitch chat! Live now at https://www.twitch.tv/OfficialMFGG with Jackbox Party Pack. Join in by going to jackbox.tv with room code RKPI! OfficialMFGG is now live with Mario Kart 8 Deluxe! Join in on the multiplayer fun by following on-screen instructions at http://www.twitch.tv/OfficialMFGG!